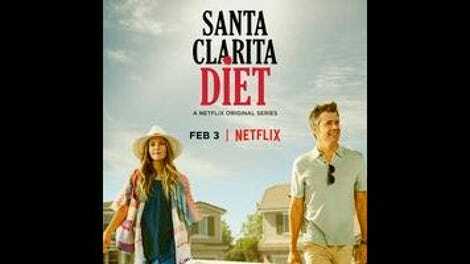 Kudos to the Netflix marketing department for finding a clever way of spreading the word about the innocuously titled, star-powered comedy Santa Clarita Diet. In print ads and TV spots, Drew Barrymore and Timothy Olyphant sing the virtues of a new lifestyle with a powerful secret: It’s all about eating people. In its surprises and winks, the campaign encapsulates the savvily surreal product it’s promoting, a show that puts the “gory” in “allegory,” while still feeling a little light on substance. Barrymore stars as Sheila Hammond, one half of a husband-and-wife realty team who loses her lunch—several days worth of meals, really—and passes out in the middle of showing a house. When she comes to, her inhibitions are lowered, her libido is heightened, and her hunger is ravenous. Nothing hits the spot until she goes to town on some raw meat, but that craving is quickly replaced by a taste for human flesh. At a certain point, the signs start adding up for Sheila, her husband Joel (Timothy Olyphant), their daughter Abby (Liv Hewson), and the paranormal expert next door (Skyler Gisondo as Eric): Mom’s undead. The vomit gag is an early indicator, but Santa Clarita Diet subtly shifts gears over the course of its first episode, beginning as a bright spoof of suburban living and ending as a full-tilt, blood-spattered horror-comedy. It’s not a total shock coming from Victor Fresco, whose work on Better Off Ted and Andy Richter Controls The Universe swirled genre elements into more conventional sitcoms setups. What’s shocking is Santa Clarita Diet’s commitment to extremes, whether it’s the fake blood coating Barrymore’s face or the daffy heights Olyphant hits as a husband and father whose entire life has been upended. It’s a noisy show, figuratively and literally. It’s also a show that could only exist in the era of Peak TV, when enough outlets are willing to take a risk on a concept like Santa Clarita Diet that two other viscera-spraying, foul-mouthed living-dead half-hours already beat it to air. For Barrymore, it’s a return to her roots—not quite a Winona Ryder-Stranger Things moment, but reminiscent of the actor’s experience playing the deceptively dangerous force in the type of movie that inspired Stranger Things. She’s clearly having a good time in the role, though she’s not always completely dialed into Santa Clarita Diet’s particular brand of weird. If Olyphant can sometimes be a little too high-pitched, Barrymore trends low-key in a way that undercuts some of the show’s outlandish aspects. (And, on occasion, almost seems like she’s mimicking the head-bobbing, mush-mouthed Barrymore impressions done by Kristen Wiig and Abbi Jacobson.) But when she matches its manic energy—anytime Sheila attacks a future meal, or the running gag where Mrs. and Mr. Hammond reflect on an aggressive rendezvous in a Target bathroom—her punchlines land harder and more successfully. Marquee names aside, Santa Clarita Diet is a writing-forward show, balancing its supernatural mystery story with down-to-earth plots that could apply to any family dealing with a recent trauma. It’s a strange premise, and Fresco and company strike an equally strange tone, a chipper dark comedy using its upbeat attitude to lampoon the blindly assertive, Power Of Positive Thinking stances taken by undead Sheila. It’s a sharp-witted screwball vibe that distances Santa Clarita Diet from the Looney Tunes chaos of Ash Vs. Evil Dead and Stan Against Evil. Its characters and situations are still cartoonish, but in that Better Off Ted way where everyone around the Hammonds is a high-status idiot whose tunnel vision prevents them from seeing the bone-chilling misdeeds occurring in their periphery. The envy and awe inspired by the “new and improved” Sheila is the source of Santa Clarita Diet’s sharpest satirical barbs. The neighbors marvel at and copy her impulse purchases and bullish behavior, blissfully ignorant of the body count that comes with it. (Can’t make a zombie omelette without cracking a few consumerism eggs.) With a little more insight into the situation, Abby copes by ditching class and getting revenge on behalf of Eric and her best friend, but it amounts to basic teen-rebellion stuff that never rises to the level of Liv Hewson’s very real, very funny performance. The show also raises some tough questions about how far the Hammonds are willing to go to keep Sheila fed, but it’s not really interested in the moral implications of the answers. Piling skeletons into the family’s closet, the writing opts for a situation that increases narrative tension over one that enriches its characters. The fact that there’s a cop living on either side of the Hammonds produces some great Olyphant freak outs, though. Maybe this is for the best, considering that the food-supply predicament is straight out of Little Shop Of Horrors. At a nuts-and-bolts level, Santa Clarita Diet isn’t entirely novel: In addition to those Ash Vs. Evil Dead and Stan Against Evil parallels, the show is essentially a sitcom hybridization of iZombie and The Americans. The main attraction, and the thing that’ll pull viewers from one episode to the next, is the show’s deranged energy. Olyphant’s been here before, with his recurring role on The Grinder, another high-concept, gag-driven sitcom populated by weirdos who spoke in droll quips and one-liners. It might not be the type of thing you’ll want to feast on, but Santa Clarita Diet is good for a little snack here or there.